2017 is coming up fast! This means that it’s the perfect time for us to look at important trends in the global digital marketplace. We don’t think any of this will shock you, and it shouldn’t when looking around the corner. We’ve put together this list to help add structure to some key movements that you have seen and provide a concise group of trends upon which you can and should act. Note: These digital trends are not listed in any particular order. They will affect businesses to varying degrees, but are all important. The proliferation of ad blockers has been massive since Apple allowed them on their store in 2015. 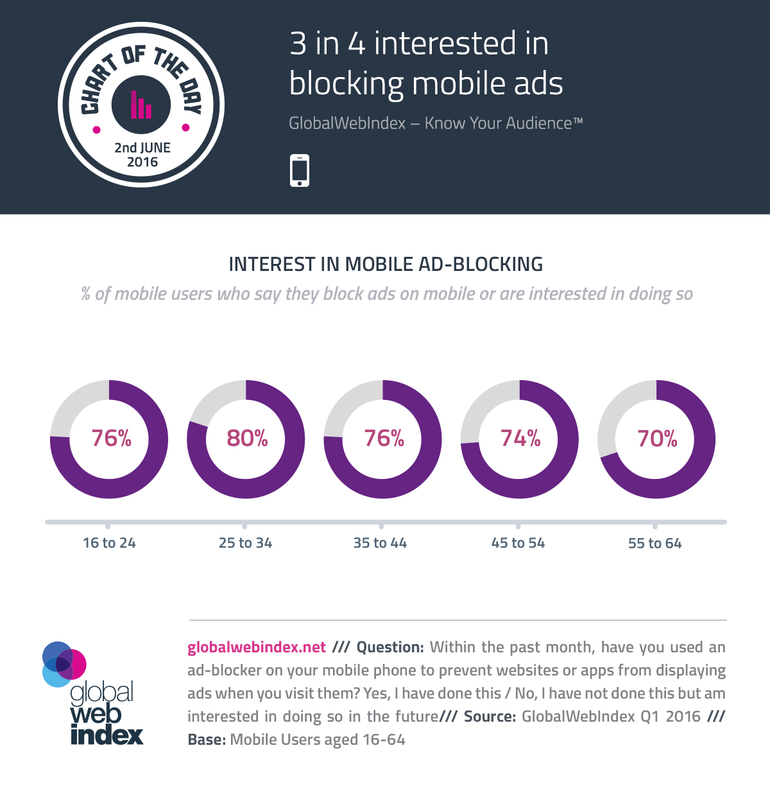 According to a recent study by Global Web Index, 3 out of 4 mobile users worldwide are blocking ads or are interested in doing so. That’s huge! To make this trend even more dramatic, some network providers are looking at blocking ads at the network level. What this means for brands is that content needs to be more engaging, entertaining and valuable than ever in order to get through to consumers. Many brands are doing this to great effect; Red Bull is a good example of a business that is nailing it by producing a popular music academy, an online tv station, a motorsport magazine and a myriad of events. This is an extreme example of course, but the message is clear; why bother with ads when you can create content that people actually enjoy and share? When the internet hit the mainstream, it gave exposure for brands from all around the world to anyone who had a working internet connection. In those early days, just being present online was an achievement. Once people became accustomed to the idea of shopping and researching products online, they started to expect more from online shops than just presence. Now consumers want brands to adapt to their locales as well as speak their language as a local would. So globalisation and localisation have been combined in the portmanteau of glocalisation. Brands that can adapt their products and content to local conditions will stand out from the pack. Research by Common Sense Advisory shows that consumers of all ages prefer information in their own language. Disruption is so hot right now. Companies like Uber and Airbnb have achieved incredible growth by using cloud based platforms to cut out the middle man. Android and Apple have benefited hugely from platform thinking as well (does anyone remember Symbian?). What these platforms excel at doing is creating low-friction markets for buyers and suppliers to interact on. Transactions are made with ease, and the participants gain benefits from the extra value (even though this has been disputed). It’s not about having the best product anymore, but the platform through which it is sold. There are two kinds of enterprises in the world; those that have been hacked and those who don’t know it yet. That’s how the saying goes at least. What’s clear is that your data has value and that people will attack your business to try to get it. The upshot is that businesses need to take steps to protect this data. This trend will keep growing over the coming years and the concept of cybersecurity will continue its progress to the forefront of our minds when making purchasing decisions. As evidence of the rapidly growing importance of cyber security, check out the cybersecurity start-up investment numbers from CB Insights. The demand for digital content will continue to grow as more screens are switched on and people spend increasing amounts of time using them. But there is also a move in the types of content that people want to consume digitally as their phones’ capabilities expand and connection speeds improve. The obvious change is the increase in video content. 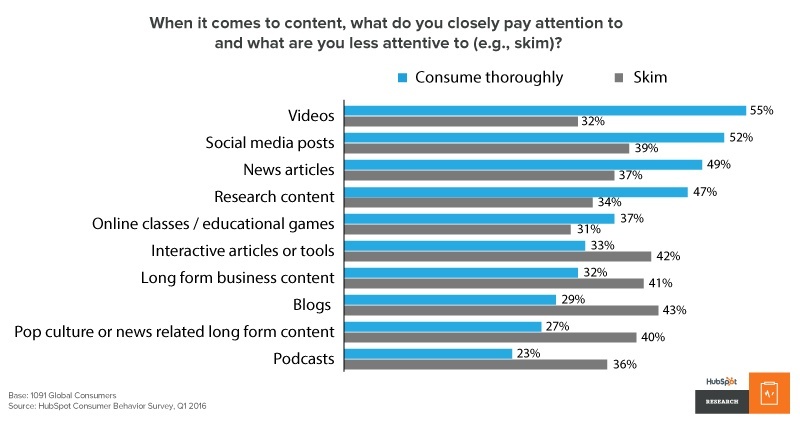 Check out this recent chart from Hubspot, included in their post on the future of content marketing. Fortunately, it’s easier than ever to create video content. The cost of cameras and lighting has dramatically decreased and every man and his dog can post a video online now (most likely one about cats). The big differentiator going forward will be the quality of content. It’s not enough to pump out blog post after blog post, and in order to generate leads, brands will have to focus on highly valuable pieces that take more time to produce. With increased customer expectations and technological capabilities, is the age of the customer finally here? That depends on who you ask. Customers long for the service that was once had in the local store (which maybe is a nostalgic ideal of the mind rather the than reality). A place where your name, your needs and your tastes were known immediately upon entering. In order to be able to achieve this online, marketing teams must collect and utilise data and content that’s suited to every stage of the customer journey, in every language and for every relevant need. Many brands struggle just to get content published, let alone have it personalised and targeted to unique customer personas. So this may still be some time off. Accenture Interactive found that customers’ expectations aren’t being met. Unfortunately, businesses aren’t even close. You can read more from Accenture Interactive’s comprehensive survey here. This problem is precisely what omnichannel marketing aims to fix. Even if brands’ actions are lagging behind customers’ expectations, those that start to create better experiences now will benefit in the long-term. You can read more about omnichannel marketing in our four-part series on the topic. Standing still is not an option in the global marketplace. If businesses aren’t improving, others are ready to pass them. And once they’ve been overtaken, it’s hard to catch up again. So CEOs must be aware where their industry is heading and make adjustments to their own brand’s trajectory. Take a look at the case of Blockbuster. Netflix came along and shook up the on-demand video entertainment market, overtaking Blockbuster and confining it to history. The video rental store chain went from over 4,000 stores to announcing the end of its retail stores and dvd by mail services in 2014. To make matters worse, Netflix offered to work with Blockbuster in 2000 and was rebuffed. The company was worried about cannibalising its own business with an online service (what would happen to late fees?) and was ultimately crushed. Such changes may come in the form of disruption or the unlocking of opportunities on the edge. No matter how they happen, the global marketplace has opened up a world of innovation, making stories like Blockbuster a more regular occurrence. So those are a couple of major digital trends that will be changing the way we do business going into 2017. They come from the perspective of us here at LanguageWire, an innovative player in the language industry, and have therefore been filtered through our distinct lens. But we believe that these trends will shape the way businesses invest and behave across industries and countries. Those that adjust their course and choose the best approach will see what the future holds for many years to come.